Teleport back to Ancient Egypt where Cleopatra once ruled the land with Ancient Egypt Classic. There are so many Egyptian-themed UK casino slots out there and this one is just as fun. So, if you enjoy slots with an Egyptian theme, then hit spin! 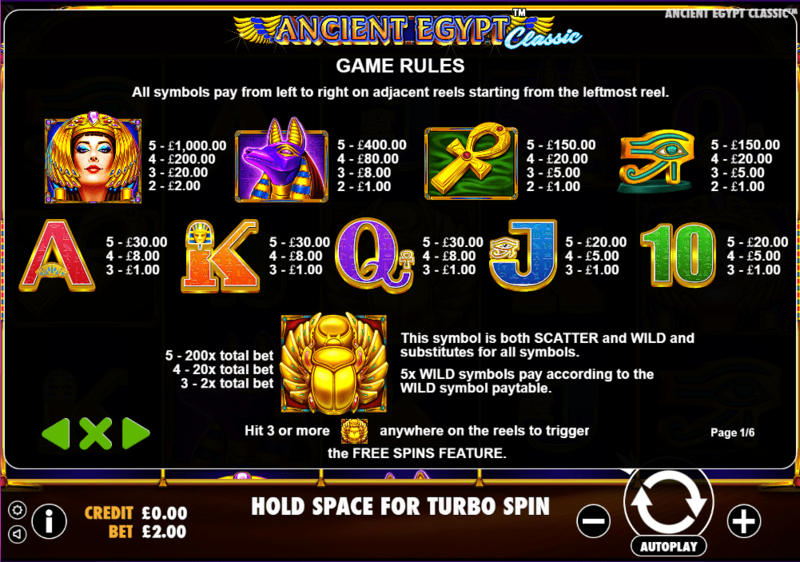 Ancient Egypt Classic is a 5 reel, 20 payline slot by Pragmatic Play. It has stunning 3D cartoon graphics and a royal golden design fit for a Pharaoh. Of course, there's an Egyptian-themed soundtrack to listen to while you play to get you in the zone. This slot has many fantastic features and hidden treasures including jackpots, bonuses, free spins, and mini-games. Pragmatic Play is one of the worlds leading providers of online games in the international iGaming industry. They have a variety of products on offer ranging from slots to scratchcards, live casino, and bingo. To create the best slots out there, Pragmatic Play combines uniqueness with reliability and a passion for ultimate entertainment. They currently have over 100 games in their collection that are all designed for fantastic user experience on both desktop and mobile. Some of their most popular slots include Wolf Gold, Great Rhino and Da Vinci's Treasure. If you liked Ancient Egypt Classic, why not take a look at these Egyptian-themed slots? Ancient Egypt Classic is another Egyptian-themed slot to add to your favourites. This slot has 5 reels and 20 paylines and has the overly popular Cleopatra theme. The design is simple but fits to the theme well. Behind the reels, you'll see what it's like deep inside one of the most famous ruler's pyramids. The flaming torches give the pyramid a lovely orange glow. You'll also see two sand sculptures of Anubis, an ancient Egyptian God and a wall filled with hieroglyphics. 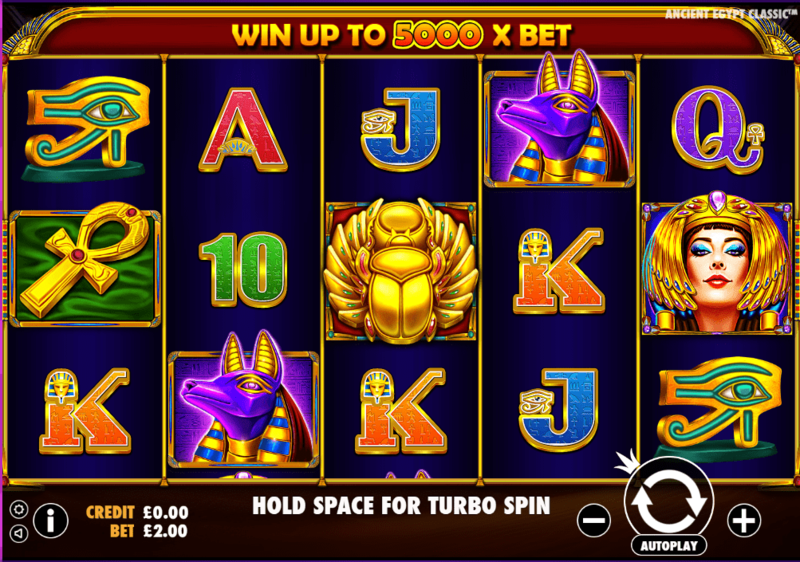 The reels are edged with gold and Cleopatra sits above giving it a very regal feel whilst you play video slot games. On the reels, you'll find playing cards, the Eye of Horus, an ankh cross, Cleopatra and Anubis. Egyptian Symbols - The lowest paying symbols are the Eye of Horus and ankh cross. These both payout up to 75x your total stake. Next comes Anubis who rewards you with a 200x multiplier. The most rewarding symbol is, of course, Cleopatra and she offers you up to 500x your total stake. The Wild and Scatter Symbol - The wild and scatter symbols are the golden scarab beetle. Landing 3, 4 or 5 golden scarabs will award you with a 2, 20 or 200x multiplier retrospectively. Doing this will also unlock the free spins feature where you will immediately gain 10 free spins. Free Spins - Once the free spins feature has been unlocked, a sarcophagus will open and randomly select one symbol. The special symbol chosen has magical properties, how exciting! When the special symbols land on the reels, it will expand and cover the entire reel with special symbols to help create a great winning combination. Play this game now and experience why it's among worlds best slot games online. If you enjoy the classic Egyptian-themed slots then you will enjoy this one just as much. Ancient Egypt Classic has a beautiful and luxurious design with fairly simple gameplay. The upbeat Egyptian soundtrack certainly adds to the whole gaming experience too. With prizes of up to 5, 000 times your total stake on offer, it's possible that you'll be feeling like Cleopatra soon. Or if you fancy a different scene, why not check out Lucha Legends?